what I'm trying to do is project a newly spawned model in the direction that the camera is facing, but I can't quite work out the correct formula to do this. Apologies for asking such a basic question, thing is I still haven't gotten a real handle on calculating directions from velocity, and velocity to directions in 3d space, it's kind of embarrassing but i'm sure I'll get the hang of it eventually. Anyway, can anyone offer some suggestions on how to sole this problem? jinxtengu wrote: what I'm trying to do is project a newly spawned model in the direction that the camera is facing, but I can't quite work out the correct formula to do this. Here's a example for a FPS-esque setup ( mouse + WASD ) that uses camera rotation over the X and Y axes. The thing you want to take a look at in the source is the ZExpression in App.OnUpdate ( with comment "Check this out!" ). No worries, it's not as straight-forward as you might expect. Thanks for the code example Kjell. I tried to follow it, unfortunately I was unable to get it to work in the game. Here's the zgeproj file of what I was doing so you can take a look. Clicking the mouse spawns a bullet. - Always use local variables when possible .. and otherwise never give components names that collide with properties ( in any scope ). So instead of putting 3 Variable components named "x", "y" and "t" in bulletmodel.Definitions, use local variables as i did in my example. - Use centerMouse after you've processed the mouse input, not before .. otherwise the mouse input will always be zero So call centerMouse after assigning Facing_z and frontView. - If you're not using a fixed framerate, always incorporate deltaTime into any variables that are time-based. So instead of incrementing bulletlife by 1 each frame, add App.DeltaTime instead. Here's your project with just those 3 things changed ( i didn't touch anything else ). Thanks Kjell. The example works after making those changes, also thank you for pointing out my mistakes. This is very helpful to me as I don't get feedback very often, so I never know if I'm doing things in a smart way or not. in relation to it's x,y,z velocity, and also (separately) in relation to the direction the camera is facing? Ahah, cool cool. I suspected that was the problem. Er, I'm still having a bit of an issue directing moving objects. But it only sets the direction for objects moving in a circle and not up and down. 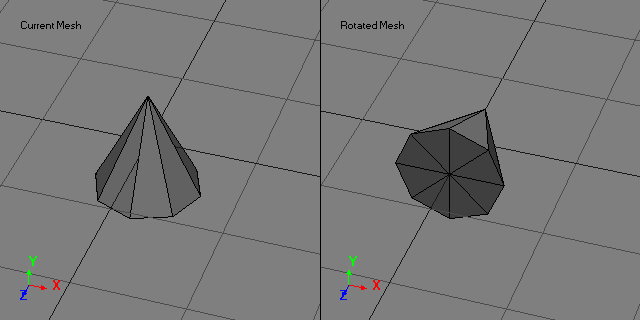 How can we set CurrentModel.Rotation.X and Z, to behave in the same manner? Usually you want to do it the other way around by calculating the velocity from the rotation values. Here's another quick demo ..